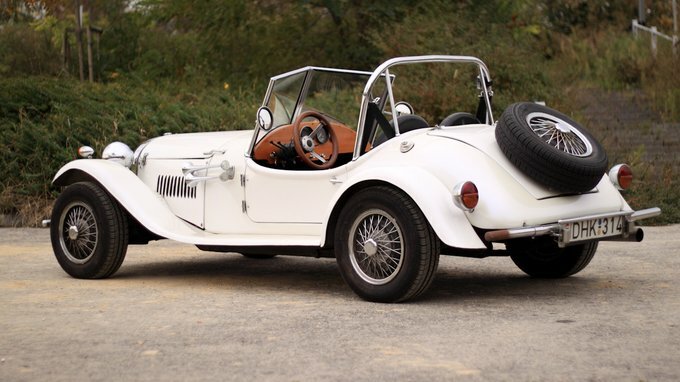 The top circle comrades of the mighty Soviet Union may have had their fair share of luxuries but they were in trouble when they wanted to drive their lovers to their datchas in a roadster. A couple of years back Totalcar's crew celebrated the forty years history of Russia's mightiest car with a Lada-week. During one of the editorial meetings I presented those classic specimens that I managed to get my hands on for a review. Two of my colleagues, namely Tibi Papp and Csik let out a passionate „Oh my God!”. Interestingly, they managed to do so while being on the two opposite ends of the emotional spectrum when it comes to cars. Tibi's OMG was a kind of disgusted cry for help, like if I'd shown him a sumo wrestler in a pink thong doing pole dancing. Csikós, on the other hand, pushed me aside so he could drool on my computer screen without interruption. This duality shows everything this car represents, whether it's the technology or the look-and-feel that matters. And you thought the chicken or the egg dilemma is tough. Well, think again. 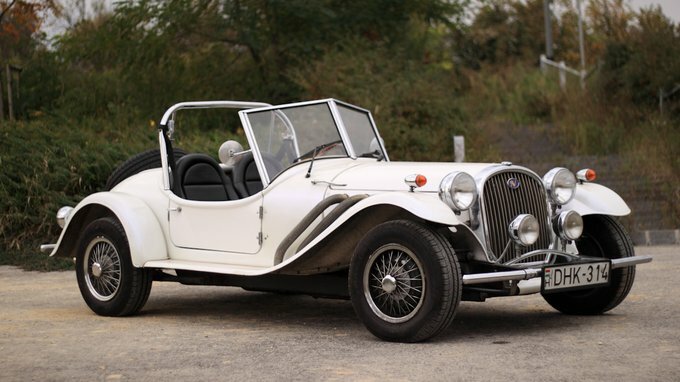 If there is such a thing as a kit-car replica, the Noel Roadster certainly belongs to that group. 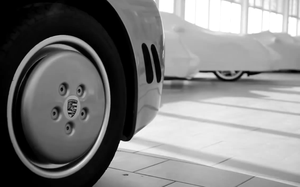 Its origin dates back to the 80's, when a talented mechanic of a Hungarian village decided to dream big. His next decision was to make that dream come true. You see, being the fan of the 30's luxury roadsters, like the Merceds SSK or Aston Martin Ulster, in a country where you had to wait in line for years to buy a Trabant is far from ideal. But since you could buy Lada-parts on every corner, our mechanic went to work. He took some 50x100 rods, built a chassis, bent and hammered some sheet metal into shape, put some red paint on it, and to make the whole car work, he threw the engine, transmission, suspension and drivetrain of a Lada 1200 in it. 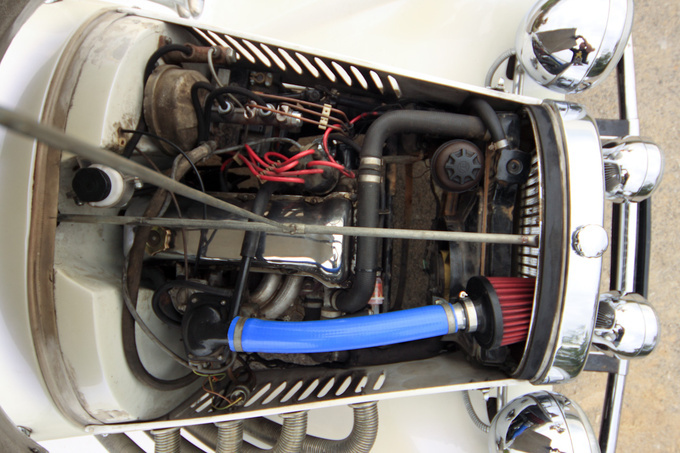 He custom-built some parts – like the driveshaft for example – and installed the petrol tank of a Wartburg. That was pretty much it. What I particularly liked were some of the smaller parts that he made in his workshop. 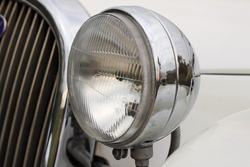 The indicators are the result of mating a Barkas van's indicator with a bicycle headlight. Same method with the headlights, but this time he married parts of a Trabant and a Csepel truck. Now, that you're done googling the latter, let's get back to the Noel which was originally named Arsenal Roadster. In a country where the authorities would pretty much shoot you for tinting your car windows, it's quite a miracle that it actually got a license plate. Yes, it is road-legal. 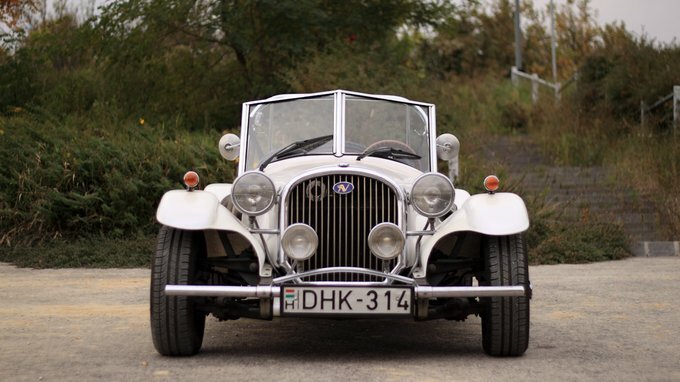 The mechanic built another two-three roadsters and then sold the plans and rights to a businessman from Budapest. The businessman then built another handful of the cars, but instead of using metal, he built the body out of plastic. Oh, and he also renamed the car to Imperial Roadster. So you see, the Imperial (which was later renamed again to Noel, because Mercedes already owned the name) is actually the replica of a kit-car. Calling it a hotrod would be quite an overstatement with its 62 PS four-cylinder engine. So let's stick to replica and kit-car. In terms of looks it's actually quite pretty, especially if you consider its humble origin, but it's far smaller than the pictures show. It's 3.58 meters long, 1.54 in width and weighs about 720 kilograms. What it lacks in size it makes up in enthusiasm, especially when it comes to its surroundings. In the land of blue Suzuki Swifts and grey Ford Mondeos, the Noel Roadster is quite a looker. Even if its proportions are a bit off balance. The windshield is too big, its frame is too thick and it's in a weird angle. It would look far better on a motorboat. There's one thing I particularly hated on the exterior: the fake exhaust pipes on its side. The only thing entering and exiting them is the draught, nothing else. They have as much function as a ”Turbo” sticker on a toaster. Getting into the car the size of a soapbox is not without difficulties, but once inside, it's actually OK. Unless, of course, you are about to drive it. It's got enough wood on the dash and the doors for a medium bookshelf, which makes the sound of shutting the door pretty unique. But having the gauges from a Lada 1500 is a delight. Same thing goes for having to turn on the ignition on the left. 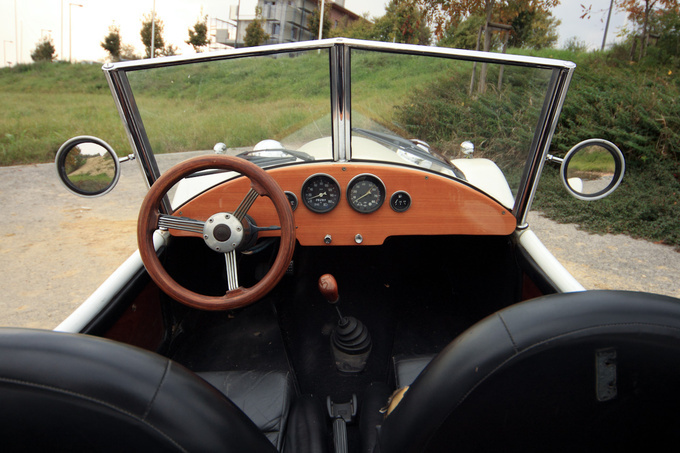 After I got in and grabbed the wooden steering wheel firmly with my hands and knees, I was anxious to put it in gear. If you've never tried a Lada-transmission you've truly missed out on something epic. Not sure I should admit it in this day and age, but it still is sort of a benchmark when it comes to shifting gears. To add to my joy, the gearlever was cut shorter, making the mechanical heaven that more direct. Also, thanks to that, the lever fit nicely under my thigh in first and second gear. Sitting in wasn't hard, unlike actually driving it. It was a strange mix of weird, scary and wonderful. Weird, because I was only about 20 centimeters above the ground, and looking at the road through a split windshield is not without some drawbacks. Especially, since I spent just as much time looking at the car while driving, as monitoring the traffic. Not the best idea in a car half the size of a Maruti. This, of course, made the experience pretty scary. I'm not sure how many stars it'd be worth at the Euro NCAP, since it would probably end up being a sticker on the wall after a crash test. My lungs being the airbags and ribs being the crumple zones do not help safety either. In short: zero protection. Having to constantly think about that makes a Toyota Yaris in the mirror look like Godzilla towering over a Japanese pedestrian. The chassis twisted with every hole I drove over. But being small, I still was far from being inferior. The Noel ended up being one of the safest cars to drive since it slowed down the traffic. Everyone around me wanted to catch a glimpse. Cameras flashed, people cheered. The only thing I could do was to smile and wave, like all smart penguins do. Some drivers went even further and tried buying it. While driving! On one of the main roads a VW caught up with me and the driver with a big moustache and even bigger hat started bargaining. The speedo showed 70 and I showed it's not for sale. Had he known the price of the Noel, he would've never tried. The car cost about 20,000 Euros at the time. If I follow Tibi's sound judgement, I'd say it's ridiculous. For that amount, I could buy a new car that has heating, ABS, boot space, measurable performance and maybe even a roof. Tibi is right. On the other hand, Csik is also right. For twenty grand I'd get a unique car that turns more heads than an SLS AMG and can still be serviced for pocket change. Even if driving it is like entering in a soapbox derby with a car that's as quiet and smooth as marbles in a blender. But in reality the Noel Roadster is not a car. It's a costume. A cheap, plastic knockoff instead of a Hollywood celebrity's silk suit. Put it on and you put on the casual glamour of the 30's to protect you from the soulless uniformity of the 21st century. Who cares if you freeze to death in the process? What the designers accomplished 30 years ago would still be a great achievement today.